Cell culture supernates, serum and plasma(heparin1 EDTA, citrate}. Intra-Assay Precision (Precision within an assay) Three samples of known concentration were tested on one plate to assess intra-assay precision. Inter-Assay Precision (Precision between assays) Three samples of known concentration were tested in separate assays to assess inter-assay precision. MBS176511 is a ready-to-use microwell, strip plate ELISA (enzyme-linked immunosorbent assay) Kit for analyzing the presence of the CXCL5/ENA-78, ELISA Kit target analytes in biological samples. The concentration gradients of the kit standards or positive controls render a theoretical kit detection range in biological research samples containing CXCL5. 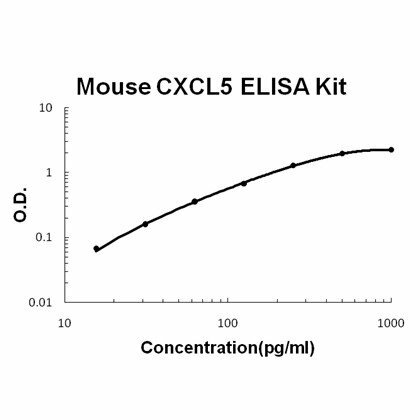 The ELISA analytical biochemical technique of the MBS176511 kit is based on CXCL5 antibody-CXCL5 antigen interactions (immunosorbency) and an HRP colorimetric detection system to detect CXCL5 antigen targets in samples. The ELISA Kit is designed to detect native, not recombinant, CXCL5. Appropriate sample types may include undiluted body fluids and/or tissue homogenates, secretions. Quality control assays assessing reproducibility identified the intra-assay CV (%) and inter-assay CV(%). Principle of the Assay: The mouse CXCL5 ELISA Kit was based on standard sandwich enzyme-linked immune-sorbent assay technology. A monoclonal antibody from rat specific for CXCL5 has been precoated onto 96-well plates. Standards (Expression system for standard: E.coli, Immunogen sequence: V45-A118) and test samples are added to the wells, a biotinylated detection polyclonal antibody from goat specific for CXCL5 is added subsequently and then followed by washing with PBS or TBS buffer. Avidin-Biotin-Peroxidase Complex was added and unbound conjugates were washed away with PBS or TBS buffer. HRP substrate TMB was used to visualize HRP enzymatic reaction. TMB was catalyzed by HRP to produce a blue color product that changed into yellow after adding acidic stop solution. The density of yellow is proportional to the mouse CXCL5 amount of sample captured in plate. Background/Introduction: C-X-C motif chemokine 5 is a protein that in humans encoded by the CXCL5 gene. The protein encoded by this gene, CXCL5 is a small cytokine belonging to the CXC chemokine family that is also known as epithelial-derived neutrophil-activating peptide 78 (ENA-78). It is produced following stimulation of cells with the inflammatory cytokines interleukin-1 or tumor necrosis factor-alpha. Expression of CXCL5 has also been observed in eosinophils, and can be inhibited with the type II interferon IFN-y. This chemokine stimulates the chemotaxis of neutrophils possessing angiogenic properties. It elicits these effects by interacting with the cell surface chemokine receptor CXCR2. The gene for CXCL5 is encoded on four exons and is located on humanchromosome 4 amongst several other CXC chemokine genes. CXCL5 has been implicated in connective tissue remodeling. CXCL5 plays a role in reducing sensitivity to sunburn pain in some subjects, and is a potential target which can be utilized to understand more about pain in other inflammatory conditions like arthritis and cystitis. CXCL6: Chemotactic for neutrophil granulocytes. Belongs to the intercrine alpha (chemokine CxC) family. 1. CXCL5 regulates pulmonary responses to infection and plays a central role in conferring clock control of inflammation.